It can be be day or night, or any season. At any time these fish seem to be attracted to current. 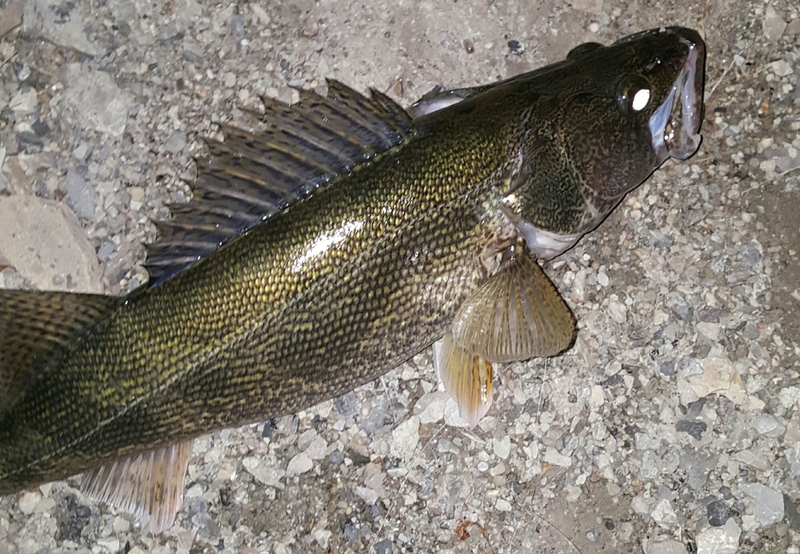 From tailraces of dams, spillways, narrow spots in the lake, feeder streams, and bridges, hit these spots from shore at the right time and chances are good that saugeyes will be there. No matter where you fish, you will find that saugeyes love current!Spillways are a natural saugeye producer. You can find a few fish in these spots any time, but expect increased action after heavy rains or after the gates have been opened for a period of time. Anytime after the water in the spillway rises is a great time to fish. Look for eddies, areas of slack current, deep holes, or where two streams meet. These are all excellent spots to pick up a few fish. Jigs are the usual choice for presentation, but crankbaits and jerkbaits work as well. Any lure that works anywhere else has potential in a spillway. For snaggy areas, a snap on bobber above a jig is an excellent choice. Set the bobber so that the jig remains close to bottom. Live bait can also be drifted with a bobber. Feeder streams are another excellent spot that is often overlooked. Heavy spring rains raise these streams and increase current, drawing in fish. Jigs with 3 inch plastic grubs have produced best for me in shallow feeder streams in the spring. If the water is stained, expect a good day bite, and a good bite near the sunrise sunset hours in clear water, or after dark. During summer and fall, crankbaits and jerkbaits are my go to lures, but jigs still produce as well. Narrow spots and bridges also naturally have current flowing through them. Picture a small hole in the bottom of a bucket and imagine the water streaming out of the hole. The flow is faster when it is narrowed. These spots really shine during drawdown periods. Shallow flats above narrow spots and bridges get flushed out like a toilet, but at a much slower pace. All the baitfish begin to migrate out of the shallow flats and must cross the narrow spot or bridge to get to deeper water. Saugeyes take advantage and wait here for the easy meal. Heavy rains and high water also increase the potential here, but some of these spots remain hot well after the drawdown period. Crankbaits, jerkbaits, and jigs work great during twilight and night periods, while more vertical presentations seem to do better during the day. Bladebaits and dropshot rigs are very popular, as well as jigging spoons. When it comes to presentation, never get hung up on one or the other. Let the fish tell you what bait they want, and how they want it. Presentation can even vary from different bodies of water. Find out what works for you. When the conditions are right, always remember to take advantage of saugeyes in current!